The Duo Capture has easily accessible level controls. NAMM 2013: Roland has updated its Duo Capture audio interface, releasing a mk2 version of this basic and compact USB device. You get 1/4-inch mic/guitar and mini jack line inputs, plus a 1/4-inch headphones socket and a mini jack line out. There are dedicated input and output volume controls and you can plug the interface into your iPad via the Camera Connection Kit. More below or on the Roland Connect website. Price and release date TBC. Making music on laptops and iPads is becoming increasingly popular but often people don't think about the quality of their audio interface (if they have one at all.) As with life itself, you only get out what you put in, so it pays to use an audio interface that supports, rather than hinders, the music making process. The DUO-CAPTURE mk 2 is a lightweight, compact audio interface that's easy to carry around - ideal if you're recording or producing music on the go. You don't have to worry about annoying power supplies either as the DUO-CAPTURE mk2 is powered by your laptop using USB bus power. Connection is simple too: all you need is a standard USB cable. 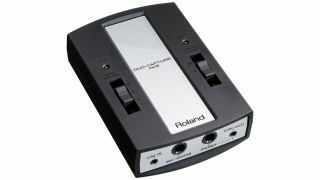 Audio interfaces need to be fast and Roland's audio technology virtually eliminates latency. In music production systems, latency is usually described as the delay between you playing a sound and hearing it: it's measured in milliseconds so the lower the number, the better. The DUO-CAPTURE's latency is among the lowest around, well under the time where latency is noticeable. You also get versatile connections that can accommodate a variety of musical equipment such as guitars, keyboards and microphones. As it's designed to be simple, the DUO-CAPTURE mk2has just the right number of buttons and knobs to get the job done- perfect if you're just starting out. More seasoned producers will appreciate a robust, no-frills interface with low-latency speeds. You can also connect to an iPad via Apple's iPad camera connection kit and start using the large number of music-making apps for iOS. The DUO-CAPTURE mk2 has two audio inputs and two audio outputs, plus two headphone outputsso the musician and engineer can listen to the same session side by side. The jack input accepts a mic or any electronic musical instrument as well as guitars/basses when switched to Hi-Z mode.